Going into the summer of 2014, many pundits predicted Marvel’s streak of box office hits would end with August’s Guardians of the Galaxy. Based on an obscure comic, the movie lacked star power and audience recognition, factors that seemed to ensure it would fall short of the financial glories enjoyed by its bigger-named predecessors. To the surprise of many, Guardians went on to become a smash. With a US take of $330 million, it ended up as the summer’s biggest hit, and it also enjoyed strong reviews. I don’t know if a movie with a $170 million budget can be called a sleeper hit, but given its pre-release predictions, Guardians kinda sorta qualifies. Guardians starts with a prologue in which we go to Earth circa 1988 to meet Peter Quill (Wyatt Oleff), a boy who loses his mother (Laura Haddock) to disease. When he flees in pain, mysterious alien forces abduct him. For a while, at least. As Peter addresses the ramifications of his actions, he finds other interested parties – and he tangles with them as well. 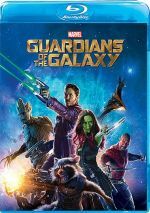 To deal with powerful threats to the universe, this leads him into a ragtag alliance with a genetically engineered raccoon known as Rocket (voiced by Bradley Cooper), his tree-based partner Groot (voiced by Vin Diesel), an assassin named Gamora (Zoe Saldana) and a vengeful warrior called Drax (Dave Bautista). They dub themselves the “Guardians of the Galaxy” and set out to save the day. That’s what we call a radical paring down of the movie’s story. Guardians comes with enough plot twists and turns that I figured a broader summary would become too long and burdensome. For a two-hour action film, this one gets into an awfully large collection of characters and situations. The narrative side of Guardians becomes its biggest weakness, as it throws too much at the viewer. No, I don’t think it becomes all that difficult for the audience to keep up, but I feel the story turns unnecessarily complicated, especially given its status as an origin tale. Normally, an effort like that would ground the characters and then send them on a journey, but Guardians attempts to do both at the same time. I think this doesn’t work especially well, especially because it tosses a seemingly never-ending complement of characters at us. We have to absorb five lead heroes, a few villains, and a mix of supporting roles, all while we try to figure out what the plot wants to do what to whom. All that in a two-hour action film makes parts of Guardians a chore; a simpler story and smaller roster of characters would’ve let it go down more smoothly. That said, Guardians does offer a fairly enjoyable experience. For the most part, it provides a peppy affair, and I like its sense of humor, as even with its galaxy-ending consequences and ponderous themes, it manages not to take itself too seriously. Of course, as a huge fan of the Dark Knight series, I don’t mind “serious” superhero fare, but Guardians benefits from its inherent sense of sassiness, especially because that tone manages to undercut some of the potentially dull drama. The humor contrasts with the underlying themes to allow the movie room to breathe. It helps that Guardians boasts a pretty terrific cast. With starring roles in Guardians and The Lego Movie, 2014 turned into a breakout year for Pratt, and I can’t say he doesn’t deserve it, as he makes Star Lord a delightful anti-hero. With a sense of casual insouciance, he feels like a mix of Spider-Man and Han Solo but still with a swagger all his own. Pratt occupies the role well and helps ground the movie, too. Most of the other actors do nicely, too, and when a film can essentially waste Glenn Close, John C. Reilly and Benecio Del Toro in small parts, I know it comes with a surfeit of talent. The only minor exception stems from Pace’s turn as Ronan. While I don’t think Pace does poorly in the part, it feels as though Ronan exists in a different movie/universe. Pace takes on the role in such a booming, self-serious manner that the character doesn’t mesh with the rest of the proceedings. Perhaps the filmmakers wanted Ronan to seem substantially more dramatic than the others, but the choice doesn’t work. Nonetheless, I like enough about Guardians to endorse it. Does it turn into a great action flick? No, mainly due to the overly complex mix of plot and characters. Nonetheless, it amuses and entertains much of the time and prompts me to look forward to the inevitable sequel. Footnote: stick around until the finish of the end credits for a little tag. I suspect most fans already know to wait for this, though. Guardians of the Galaxy appears in an aspect ratio of 2.40:1 on this Blu-ray Disc. This was usually a good image but it lacked consistent greatness. As one might expect from a flick like this, Guardians provided a stylized palette. Colors tended toward a blue and/or green tint, though they weren’t overwhelming in their orientation, and other scenes leaned in different directions. Overall, the hues appeared well-rendered and distinctive. Blacks showed good depth and darkness, while shadows usually were solid. A few shots seemed slightly dense, but those occurred infrequently. Though most of the movie provided terrific visuals, the occasional lapses dropped it to “B” level. No inconsistencies affected the excellent DTS-HD MA 7.1 soundtrack of Guardians. With a variety of action and ambient elements, the audio brought the events to life in fine fashion. Fight sequences added the greatest punch, and the pieces used all the speakers to great advantage. Quieter scenes contributed good breadth and smoothness as well. All of this meant the audio filled out the spectrum in a nice manner. Sound quality satisfied. Speech was natural and concise, without edginess or other issues. Music demonstrated good range and clarity as well. Effects worked the best of the bunch, as they were consistently dynamic and vivid. All in all, this was an active and engaging soundtrack. As we shift to extras, we open with an audio commentary from writer/director James Gunn. He delivers a running, screen-specific look at story/character areas, cast and performances, sets and visual design, music, effects, stunts and related topics. From start to finish, Gunn brings us a fine commentary. He goes into a good variety of topics and does so in a bright, enthusiastic manner. Gunn turns this into a consistently enjoyable, informative piece. Under Guide to the Galaxy, we find a 20-minute, 56-second featurette with Gunn, set decorator Richard Roberts, special makeup effects designer David White, production designer Charles Wood, property master Barry Gibbs, executive producer Victoria Alonso and actors Chris Pratt, Zoe Saldana, Dave Bautista, Michael Rooker, Benecio Del Toro, Vin Diesel and Lee Pace. The program examines color/visual/set design, music, makeup effects and character topics, effects, stunts and action. After Gunn’s fine commentary, “Guide” doesn’t come packed with fresh info, but it offers some good new nuggets – and its 80s videogame motif becomes a fun touch. Next comes The Intergalactic Visual Effects for Guardians of the Galaxy. It goes for seven minutes, 11 seconds and offers notes from Diesel, Pratt, Alonso, Gunn, and actor Bradley Cooper. “Intergalactic” mainly looks at the design/execution of Groot and Rocket, as it goes into live performances and digital renderings of the roles. The behind the scenes aspects work best and help make this a good little piece. To preview Marvel’s next big flick, we check out an Exclusive Look at Avengers: Age of Ultron. This two-minute, 17-second reel includes producer Kevin Feige, director Joss Whedon, executive producer Jeremy Latcham, and actor Elizabeth Olsen. Don’t expect any actual film footage, as “Look” combines footage from the set and concept drawings. It’s a decent teaser for fans, though. Five Deleted and Extended Scenes occupy a total of four minutes, 22 seconds. We find “The Kyln Will Have to Do” (0:46), “No, I’m the Stupid One” (0:31), “Sisterly Love” (1:47), “Dancing Guard” (0:50) and “Fake Laugh” (0:27). Most of these offer minor comedic tidbits; they’re enjoyable but not essential to the movie. “Sisterly Love” provides the one exception, as it gives us some decent character information. I don’t think the movie needs it, but it adds some good details. We can view the scenes with or without commentary from Gunn. He tells us a little about the sequences and why he cut them. Gunn delivers a good collection of notes. A Gag Reel lasts three minutes, 54 seconds. It’s mainly goofs and silliness, but a few fun improv moments make it interesting at times. 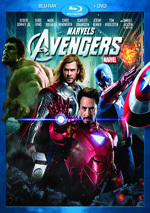 The disc opens with ads for Captain America: The Winter Soldier, various Avengers-related films, Guardians of the Galaxy: The Universal Weapon and Ultimate Spider-Man. Sneak Peeks also provides a promo for Disney Infinity and Disney Movies Anywhere. No trailer for Guardians shows up here. While not a total success, Guardians of the Galaxy does more right than wrong. 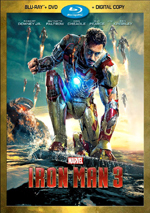 Despite an overly convoluted plot, the movie boasts enough brisk action and fun to make it enjoyable. 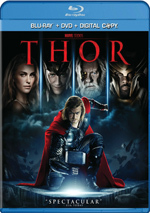 The Blu-ray comes with mostly good visuals, terrific audio and a pretty positive set of supplements. I might not adore Guardians, but I like it, and the Blu-ray usually fares well.